When you look at the average rank (26-(Total Points/Number of Voters) you can start to see a few groupings. Looking at the votes this way can show you places where voters have consensus on groups of teams, but may disagree on the order those teams should be in. Using this, the poll can be broken into to tiers. This one is easy to visualize since all 3 teams garnered some first-place votes. GCU is out in front with an average rank of 1.65. Chapman and Utah are much closer with 3.0 and 3.46 respectively. The next 4 teams might as well be interchangeable for purposes of the poll. 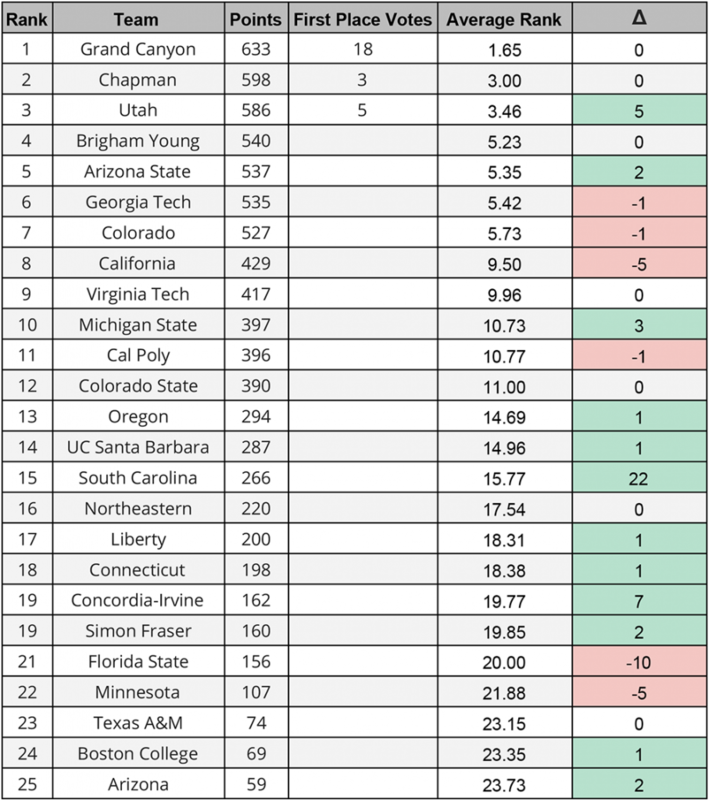 The distance between #4 BYU with an average rank of 5.23 and #7 Colorado at 5.73 means BYU, #5 Arizona State, #6 Georgia Tech, and Colorado are virtually tied. This next grouping is all on the cusp of being top 10. Cal dropped here, MSU jumped here, VT, Cal Poly, and CSU stayed here. It feels like SC should be higher than this, but this isn’t about opinions. That article is here. Oregon and UCSB are interchangeable, USC is knocking on the door behind them.